Special thank you to Amore di Mona for sponsoring this post. 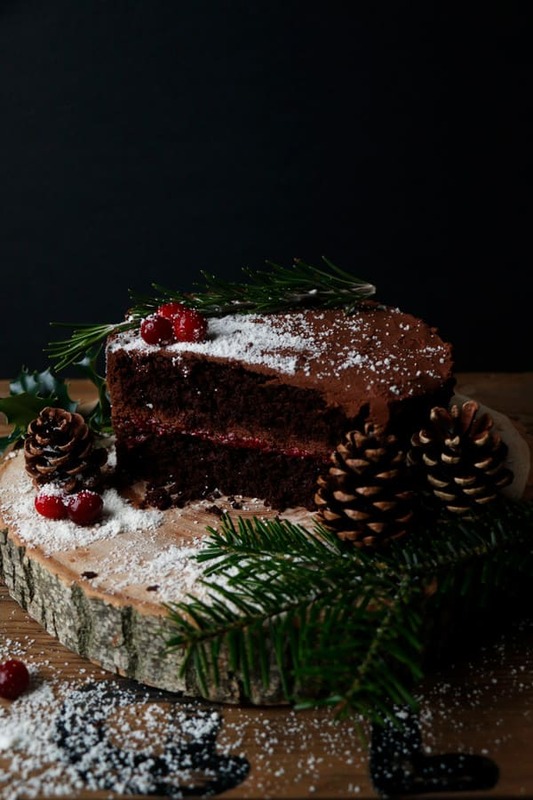 It wouldn’t be Christmas without a little indulgent chocolate cake and I have the perfect recipe for you – Vegan Chocolate Christmas Cake with rich sweet potato chocolate frosting and festive cranberry chia jam filling. 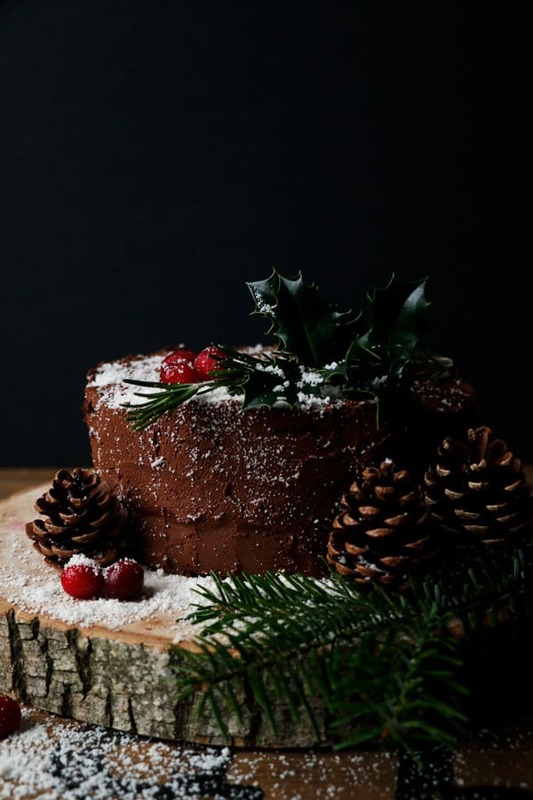 This cake is truly a decadent cake with Amore di Mona chocolate rich sponge with deep earthy flavours of teff flour and sunflower seeds that I’ve used in my gluten-free mix. The cranberry chia jam ads lovely sharpness to the cake and the whole cake is smothered in a really lovely and very simple to make sweet potato frosting. To create the snow effect I’ve blitzed some flaked coconut in my blender, which works really well. You can also use coconut flour or powder, whatever you have on hand. 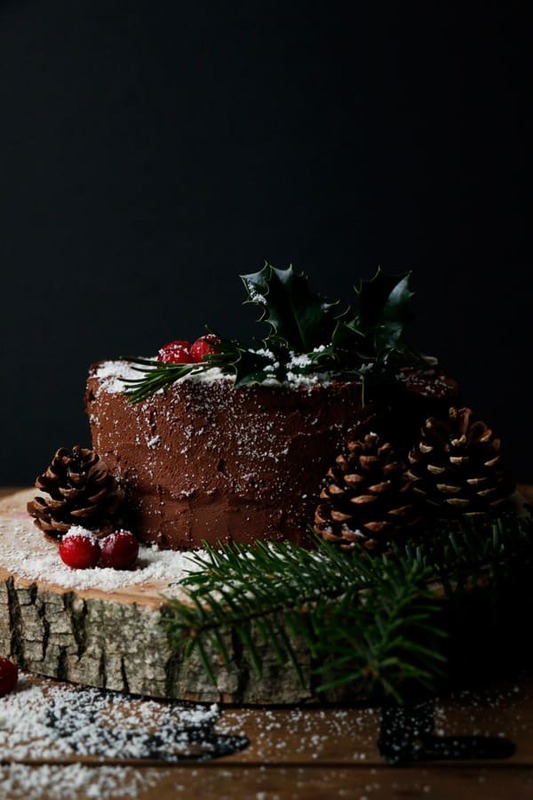 But if you need this cake to be truly coconut-free, you can use some powdered sugar unless you can think of even better option. 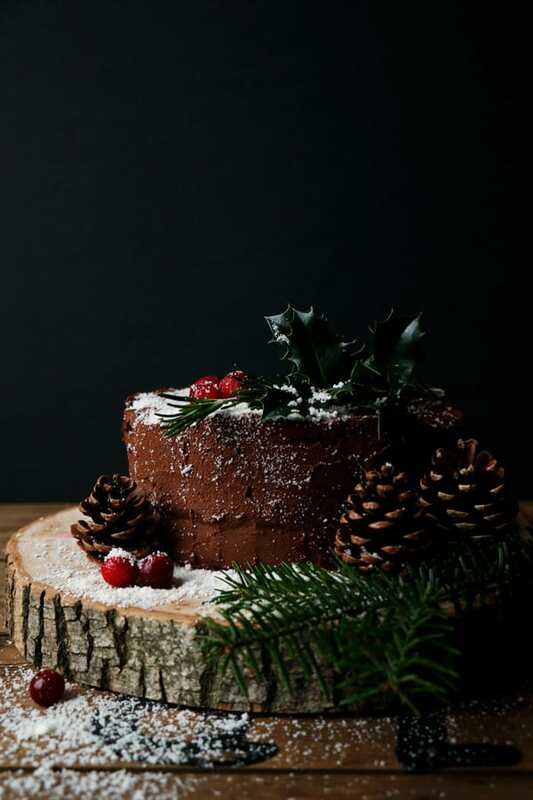 You can get really creative with decoration – pine branches, pine cones and holy all look beautiful around the cake for a festive feel. Mix 3tbsp ground flaxseed with 9tbsp water and set aside to thicken. Grease and line two 6" round cake spring form baking tins. In a large bowl whisk together teff flour, ground sunflower seeds, tapioca flour, sugar, baking powder, bicarbonate of soda and salt. In a small bowl whisk together flax eggs, olive oil, apple cider vinegar, vanilla and milk (room temperature). Roughly chop the chocolate, place into heatproof bowl and gently melt in a double boiler. Add the wet mix to the dry mix and mix until well combined. Spoon the mixture evenly into the cake tins and level out the surface. Bake for about 15 to 20 minutes or until a cocktail stick comes out with just few crumbs left on. Remove from the oven and leave to cool down for 20 minutes before carefully moving onto a wire rack. Once the cakes are completely cooled, place one cake onto a serving dish. Spread with a generous amount of cranberry jam and top with a layer of sweet potato frosting. 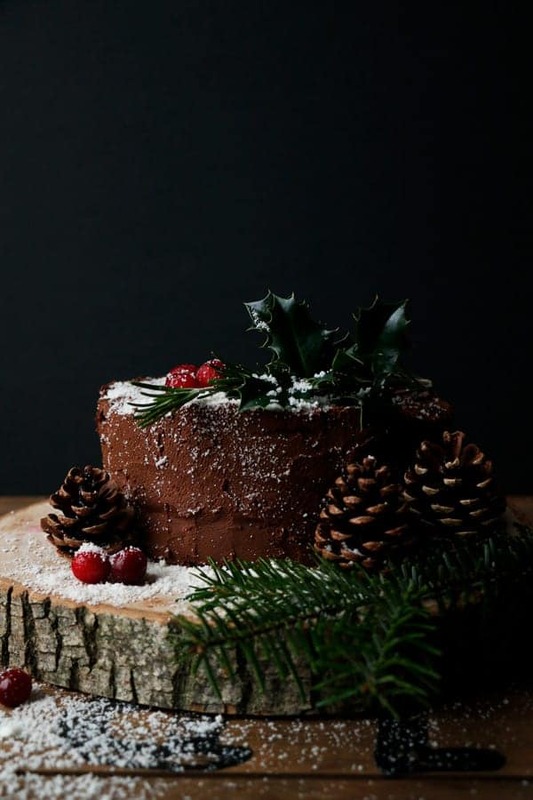 Place the second cake on top and using spatula frost the top and the sides of the cake. 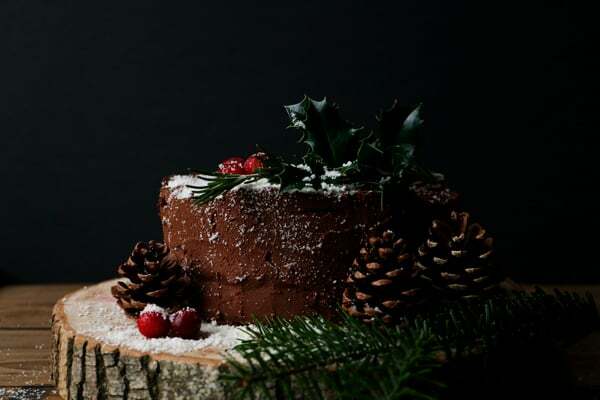 Decorate the cake with fresh or sugared cranberries and rosemary sprigs. To make the snow effect I've used blended coconut flakes, but if you need this cake to be truly coconut-free, you can use powdered sugar. To make the cranberry jam place cranberries, orange juice, maple syrup and cinnamon stick into a pot and gently heat for about 10 min until cranberries have popped and are soft. Remove the cinnamon stick and mash the cranberries with a fork until smooth. Stir in chia seeds and leave to cool down for a bit before transferring into fridge to set. To make the sweet potato chocolate frosting roast one large sweet potato until very soft and leave to cool down until it's ok to handle. Peel the skin and place into a food processor with cinnamon, sea salt and maple syrup and blend until smooth. Roughly chop the chocolate, place into heatproof bowl and gently melt in a double boiler. Fold the melted chocolate into the sweet potato puree bit by bit until you've achieved creamy frosting consistency.